Characteristics of a route such as speed limit and functional class can be represented as a linear event with starting and ending measure information along the route. 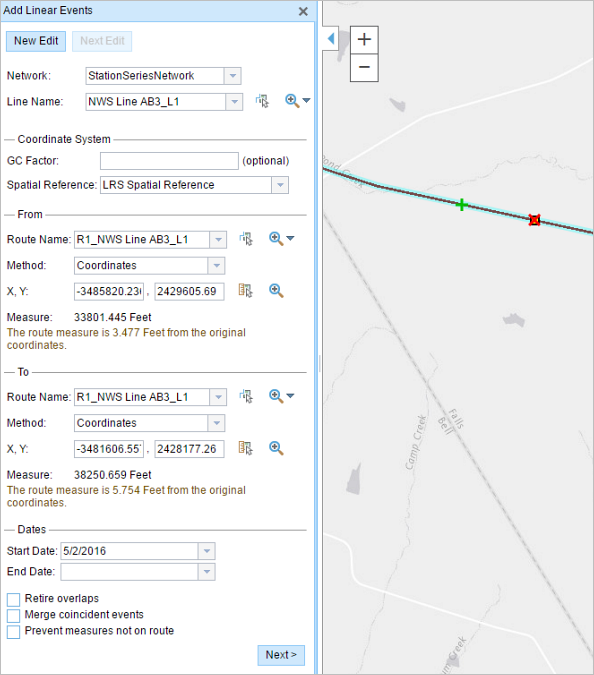 The Line Events tool provides an interface to add linear events by typing or selecting their x- and y-coordinates. You can also use reference offset data to add events to a route. The reference offset data is translated to routes and measures for storage. In cases where events are being modified on a route and you want to see the previous events on the route at that location, don't use the Add Linear Event widget. 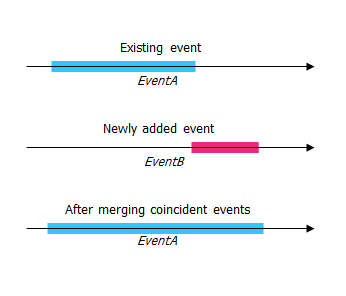 Instead, edit events in the Event Selection table or the Attribute Set Selection table. If this method is used, you can see what was previously on the routes at the specified measures. In the From section, click the Method drop-down arrow and click Coordinates. The Coordinate System section appears. Optionally type a value in the GC Factor text box. This will adjust the coordinates by dividing X and Y by the value specified. Specify a spatial reference by choosing an option from the Spatial Reference drop-down menu. Additionally, you can configure different coordinate systems by specifying the well-known ID (WKID) or well-known text (WKT) in the configuration file of your Event Editor. For more information, see Configuring the Event Editor web application. 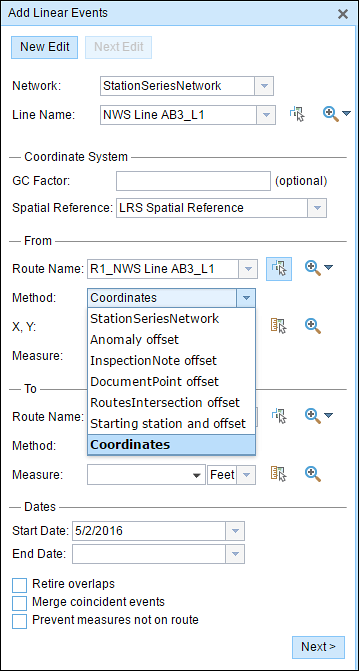 In the From section, click the Method drop-down arrow and choose Coordinates. Input the x- and y-coordinate values for X and Y. You can select a coordinate by using the Select an X/Y Location on the Map button . The route measure closest to the original coordinates will be selected and its distance from the route will be displayed. If the selected route is not in the active view of the map, click the Zoom to the route extent or center on the route start or end point on the Map button to refresh the map display to zoom in to the entire extent of the selected line. 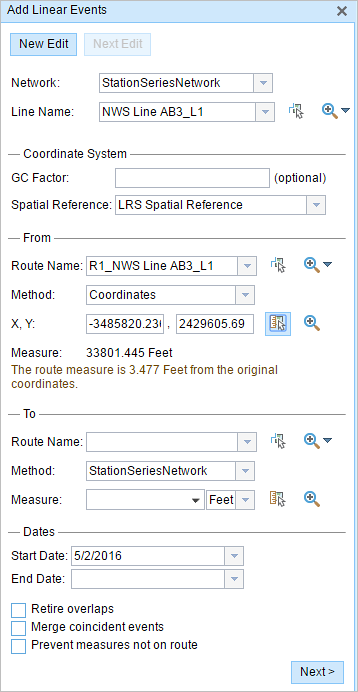 In the To section, click the Method drop-down arrow and choose Coordinates. The route measure closest to the original coordinates will be selected, and its distance from the route will be displayed. The tab showing the attribute set for the events appears. 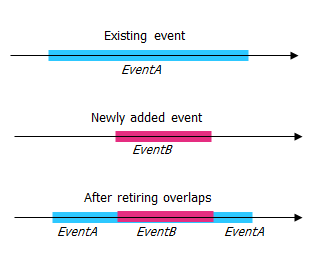 The event fields are shown under the G1 attribute group. You can use the check boxes to add data for specific events within the attribute set. No records are added for the unchecked events. As shown in the example below, no records are added to the County_A and City_A events. Checking the Go to the next measure upon save check box results in prepopulating the from measure value using the to measure value of the present section to continue the event creation process. For example, this will occur if events are created on the route using a from measure value of 0 miles and a to measure value of 0.289 miles. If you click Save with this option checked on the Attribute Set tab, the Add Linear Events widget is prepopulated with the value of 0.289 miles as the from measure value for the new events.